You have to admit, it’s cool to say… and by “say” I mean: to cry out as if to summon a thunder-god. It also works well if said quietly, as if the name, itself, was a sacred relic you almost dare not say aloud. 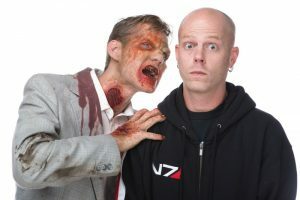 Based in Nashville, Rick Prince is a world-class special-effects makeup artist who has risen to international prominence since the fifth season of the SyFy Network’s competition series Face Off in 2013. Subsequently, he continues to be a featured artist and celebrity judge at conventions around the world. Rick has two decades of experience crafting ingenious special effects in every imaginable medium, for such clients as Walt Disney, Hasbro, Sony/BMG, Universal Studios IOA and others. He has created animatronics, robots, wearable puppets and makeup effects for a wide variety of entertainment productions. Rick has just finished realizing his lifelong dream of writing, producing and directing his first feature film, a fantasy horror story called LWA – All Saints’ Eve. Currently, Rick has written and is producing a creature-feature titled Enuattii for Rashaad Santiago (winner of Face Off season 6) to direct this fall, here, in Tennessee. Saturday at 5:30: Hypericon – Cosplay Showcase – with the top prize being $500 gift card for a Barnes & Noble shopping spree!